Starship Modeler - More news concerning sci-fi, fantasy and real space scale models, add-on and upgrade kits, and events. The Horten "Rocket Wing." Based on a rocket-powered flying-wing-style fighter designed by Germany's Horten Brothers in the waning months of WWII, this model is being produced by Anigrand Craftswork exclusively for Fantastic Plastic. The kit is expected to sell for $50. Read more about the upcoming kit here. 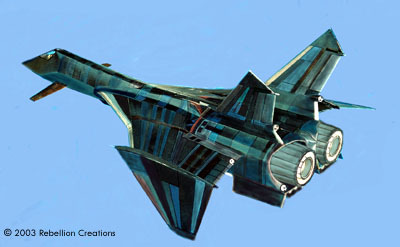 The "Whispercraft" from the 2000 Arnold Schwarzenegger movie, "THE 6TH DAY." Designed by Ron Cobb, this model is being mastered by Scott Lowther and will be cast by Controlled Energy Designs. A price has not yet been determined. Read more about the kit here. Wilco! Models newest release is now available, a 1:4 scale model kit of the Maintenance Drone as seen in Silent Running. The kit consists of pressure-cast resin parts to build one of 3 versions (Dewey, Huey or Louie), plus decals and stencils. The "Galileo" Atomic-Powered Moon Rocket (1:144) - Those who grew up on the juvenile sci-fi classics of the late 1940s and early 1950s will recognize this elegant design. The kit, mastered by Scott Lowther, is scheduled retail for $48.00 USD (subject to change). Casting is by Controlled Energy Designs. The "Aurora" Hypersonic Spy Plane (1:72) - You've heard about the Air Force's Mach 6 "Mystery Plane" for nearly 20 years. Well, here it is, mastered by Scott Lowther based on the best documentation currently available. In 1:72 scale, this is a BIG kit -- our biggest so far -- and is a "must have" for Black Project enthusiasts. The "Aurora" is scheduled to retail for $105.00USD (subject to change). Casting is again by Controlled Energy Designs. The USAF 40-Foot "Flying Disc" (1:72) - Could this circular-winged jet-powered aircraft have been the source of many of the UFO reports during the 1950s? Aviation writer Jack Pickett says so. Based on his eye-witness account of visiting the MacDill AFB in Tampa, Fla. comes this unique 1:72 kit mastered and cast by Anigrand Craftswork of Hong Kong -- an exclusive to Fantastic Plastic Models! The kit is scheduled to retail for $45.00USD (subject to change). Cylon Raider (1:48) - This one has the whole sci-fi community abuzz. 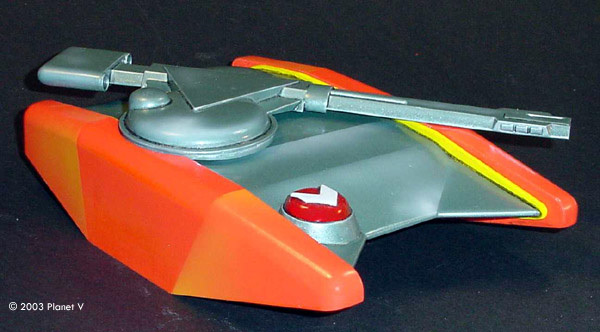 It's a highly detailed 1:48 version of the Cylon Raider featured on the Sci-Fi Channel's "Battlestar Galactica." The model is mastered by Alfred Wong and will be cast by our newest partner, BLAP! Models. The kit will sell for $75.00USD (subject to change). 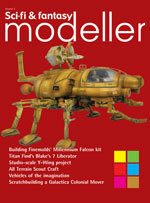 You can pre-order NOW at the Starship Modeler Store. Starfleet Academy Trainer (1:48) - From the 1993 "ST:TNG" episode "First Duty" comes this nifty fighter-sized "trainer" -- perfect for custom upgrading! This is a big, heavy model complete with a clear resin cockpit canopy and a very fetching female pilot figure. The pattern is by Alfred Wong, the casting by Controlled Energy Designs. Expected retail price is $85.00USD. You can pre-order NOW at the Starship Modeler Store. McDonnell Douglas DC-X "Delta Clipper" (1:72) - In the early 1990s, McDonnell Douglas successfully launched and landed an unammned rocket -- vertically! It was the first step in creating an actual single-stage earth-to-orbit rocket. Here's a detailed, highly accurate 1:72 model of this historic vehicle mastered and cast by BLAP! Models. The expected retail price is $56.00USD (subject to change). Pre-Orders for all these models will be accepted on the Fantastic Plastic website about three weeks before the kit's scheduled release. Led Belly Productions has produced a professional quality DVD, over 2 hours long, of last year's Wonderfest (approved by Dave Hodge). The DVD features complete show coverage of the dealer's room, model contest, special guests, and all the activities held during the weekend. Of special interest are the one-on-one interviews found nowhere else with Joe Simon, Gabe Perna, John Ulakovic, Barsom, John Pinkerton, Al Matrone, Terry Webb, David Fisher, Mark Brokaw, John Tucky, Greg Nicotero, and last but not least Jeff Yagher. Timeslip Creations is proud to announce a BIG reproduction of the original (George Pal) movie War Machine. 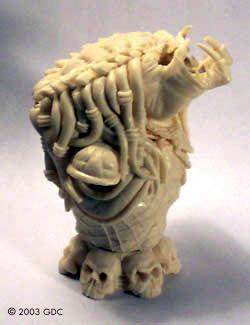 The main body and cobra head are hollow cast with plenty of room for electronics (not supplied). All clear parts are thick vacuformed plastic. 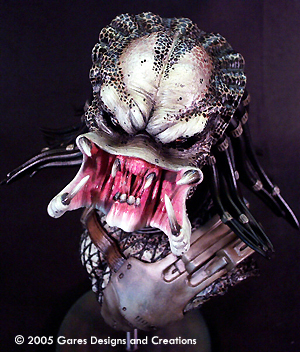 The finished model dimensions are: 35" wide, 29" long, 20" tall, plus the 23" long cobra head. 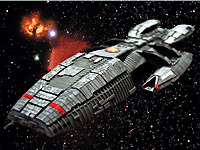 Alliance Models has released "new" Battlestar Galactica in 1:9600 scale. Mastered by Coby Lorang, this 5 piece resin kit builds into a highly detailed 6 ¾" (172mm) long model and includes a decal sheet, complete assembly and painting instructions. Price is $55.00 USD (~$ 64.01 CAN/€ 45.61 EUR ). 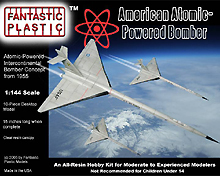 Fantastic Plastic's second project, a recreation of a 1950's atomic-powered bomber concept, is now available. The 1:144 all-resin kit was mastered by Scott Lowther of Part Time Models, cast by Controlled Energy Designs and includes decals by JBOT. The kits is comprised of 10 pressure-cast, bubble-free pieces, includes a cockpit canopy in clear resin, and measures approximately 15"/ 381mm long when assembled. 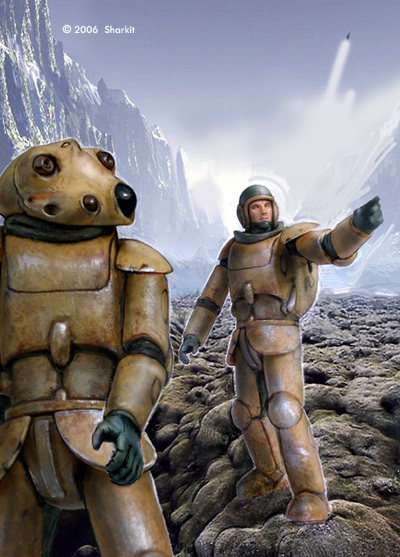 New from VooDooFX is a 'plug-n-play- lighting set for the Lost in Space Robot kits. The kit includes Pro Twin Circuit Board, 9 Volt battery hook up, pre-built LEDs, On/Off switch, full instructions and access to their Customer Support Line. It features red and blue LEDs and lights up the body and all clear parts. Wilco! 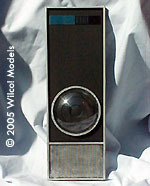 Models' newest release is 1:1 Scale Prop Replica of the HAL 9000 Interface as seen in 2001: A Space Odyssey. The kit consists of three parts; a cast-resin body, a pre-cut clear dome lens and an etched metal plate. Cost is $30.00 USD (~$35.39 CAN/€ 24.64 EUR ) plus shipping. A lighting kit is also in the works. The debut offering from "Fantastic Plastic", the British Avro 730, a supersonic bomber "concept plane," is now available. The 1:144 all-resin kit was mastered by Scott Lowther of Part Time Models, cast by Controlled Energy Designs and includes decals by JBOT. With 17 pieces and measuring 13½"/ 343mm long when assembled. New from Small Art Works is newly re-mastered spine booster for any 12" Eagle Transporter. Authentic detail includes raised paneling and 'greeblies' which match the original as close as possible. Even the underside is fully detailed. 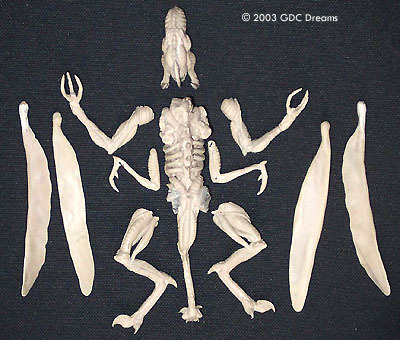 The model measures a little over 3½" inches long and consists of 15 individual parts. Mastered by E. James Small and finely detailed by Michael Dentzer, the unassembled kit is designed specifically to clip onto the spine of the 'Product Enterprise' Transporter model (not included); the kit can be adapted to fit other 12" models as well. Accurate waterslide decals printed by Jbot are also included. 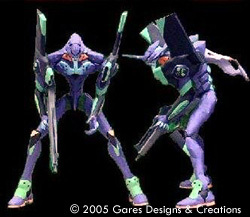 Now available from Gares Designs & Creations is a 3 foot tall (nearly 1 meter) paper model of the original main EVA-01 from Neon Genisis: Evangelion. 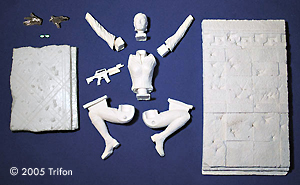 The kit includes weapons and accessories, plus a comprehensive instructions guide. 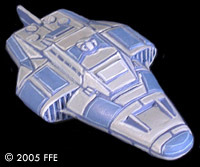 Far Future Enterprises and Mega Miniatures have teamed up to produce the broad range of Adventure-class starships from the Traveller universe. Adventure-class starships (the basic ships that Traveller players encounter and use as they travel between worlds) include free and far traders, corsairs and SDBs, scouts and escorts, cruisers and small craft. Using detailed reference material from the Traveller archives, Mega Miniatures will release a range of twelve ships during the 2006 season. The first ship in their series is the 200-ton Free Trader Beowulf. Cast in tin, the ship measures 55 mm long and comes with a plastic hexagonal flight stand. 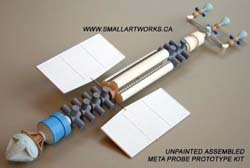 New from Small Art Works is Probeship model mastered by E. James Small and Michael Dentzer. 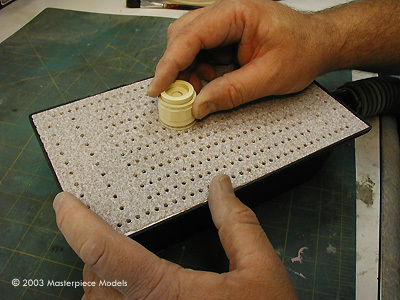 The kit's 18 parts were molded and beautifully cast by Stephen Sekulic in the highest quality urethane resin. A complete set of comprehensive decals printed by JBOT are included with the kit as well. Overall length including the hinged, positionable docking clamps is 5¼ inches (134mm). Trifon is a new company that gathersthe talents of a team of modelers from Argentina (including Guillermo Centeno from GDC Dreams) and Mexico to produce sci-fi, historical and wargaming kits in a variety of scales. 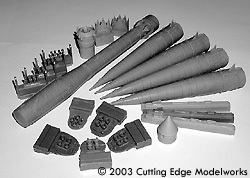 Among some familiar offerings is a brand-new 150mm kit of "Lethal: TNT" (left). This multimedia kit is comprised of 9 resin pieces and 3 in white metal. Price is $45.00 USD (~$ 55.31 CAN/€ 37.44 EUR ). 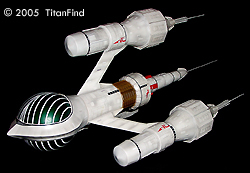 The priemere offering from TitanFind, the DSV-1 Liberator, is now available. The kit, mastered by Alfred Wong, includes 46 resin parts and is almost 14"/356mm in length when built (excluding antennae). It also includes two transparent half domes to allow for lighting of the engine section. Also included are comprehensive decals and brass rods for the antennae. 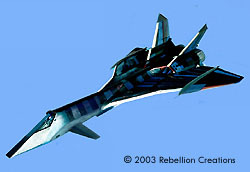 Rebellion Creations' revised 1/32 sacle MiG-31 Phase II kit will begin hipping on July 14, 2005. This multimedia kit features seated/standing pilot figures, ejector-seat, stick/throttles, detailed instrument panel/cowl, consoles, cockpit-tub, complete landing gear, cannons, missiles w/launch-rails, detailed engine/tailpiece assembly, and one-piece engine-box/wing-support insert; Detailed vacform inserts for all bay-panel doors, canopy/door-hinges; Clear PETG vacform canopy. Gares Designs & Creations has announced the release of a (non-working) 1:1 replica of the M-27 Battlefield Plasma Rifle used by the Terminators in the various Terminator films. The kit is comprised of 14 white resin pieces; it is hand finished, cleaned and inspected before shipping. Fully assembled and painted versions are available as well. 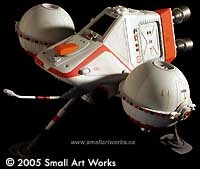 Small Art Works has announced availability of a studio scale model of the three-man scout craft from that popular seventies show. 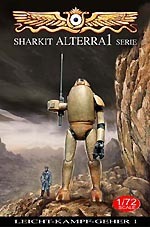 Based on extensive measurements taken from the actual studio model filmed for the FX sequences, the model includes the same "kitbashed" parts used on the original miniature for utmost accuracy. Overall length including rear engines and the "probe" on the nose is 13"/330mm; width is 113/8"/ 289mm and height is 7¼"/ 184mm. The model was mastered by E. James Small and cast by Stephen Sekulic. The body and the spherical pods are hollow cast in urethane resin to save weight and reduce distortion, and are complete with fully engraved panel lines and raised plates. Solid brass rods embedded in the legs for rigidity and strength. Also included are a complete set of comprehensive decals printed by JBOT. Leon's Pistol from Bladerunner . This 3-piece kit (pistol plus grips) is a resin casting of the C.O.P. .357 4-barrel Derringer. It's $30.00 USD (~$37.33 CAN/€ 23.12 EUR ) plus $5.00 shipping in the US. Colonial Warrior's Pistol from the original BSG. This 2-piece kit (pistol body and nozzle) is $50.00 USD (~$62.22 CAN/€ 38.54 EUR ) plus $5.00 shipping in the US. Languatron (belt-carried translation computer from the original BSG. This kit consists of 10 resin pieces (body plus keys); sheet plastic is included for the screen as is a "Languatron" decal. It's $35.00 USD (~$43.56 CAN/€ 26.98 EUR ) plus $5.00 shipping in the US. Now available from Just An Illusion is a replacement core wall piece for the Monogram Flying Sub kit. This piece is designed to replace the interior computer wall panel and has tri-colored flash (LED) lighting (red, green, blue) that will enhance interior detail and add "realism" to the panel. The kit includes replacement wall, tri-colored LED, LED box, on/off switch, a 9-volt battery connector, and instructions. 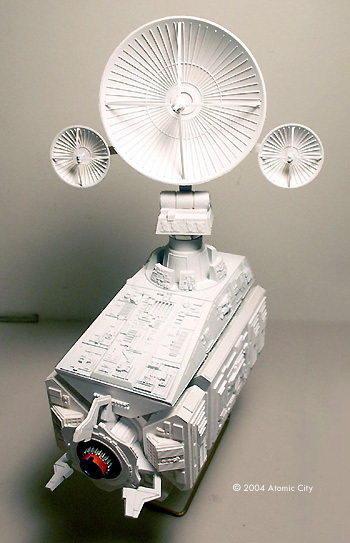 Small Art Works has announced availability of a set of accurately detailed lunar tank modelskits, to build and display with your other like-scaled 12" Moon Transporter models and collectibles. Each tank measures about 4½''/114mm long each, is molded in urethane resin with vacuformed bubble canopies (on two of the models) and can be painted with enamels, acrylics, or lacquers. The kit, which includes all three tanks, is sold exclusively by Small Art Works. It includes detailed assembly diagrams and thorough painting instructions, plus a comprehensive set of high resolution waterslide decals made by Jbot. Gares Designs and Creations have teamed up with the owner of GEOMetric Design to sell the following kit exclusives. 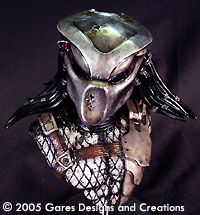 All are 1/4 scale (around 5"/127mm in height ) sculpted by Joe Simon and include bust, mounting rod and stand. 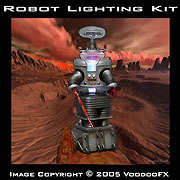 VoodooFX have released a lighting kit for the 31" RC 20 K Sub model. 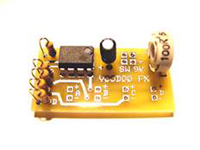 This kit includes (3) Pro Driver 8 Circuit Board, (24) Super Bright LEDs, (1) 9 Volt DC Power Jack, (1) 9 Volt Wall Transformer, and fully detailed instructions. Engine sound effects are also available. When it was first released, the Leif Ericson (a.k.a. Interplanetary U.F.O.) came not only with a phonograph record, but a set of decals. Unfortunately there were no placement instructions and the decals were removed when the kit changed it's name and became 'ghostly' as the Glow in the Dark Interplanetary U.F.O. JTGraphics have not only reproduced the old decal, but made some improvements as well. The revised decal contains both lit and unlit windows, airlock hatches and a full set of numbers. Some of the markings have been re-scaled in order to fit the ship better as well. Cost: $8.00 USD (~$ 9.90 CAN/€ 6.14 EUR ). Exotic Replicas has announced the availability of a Galaxy Quest (TV Version) Nebulizer. 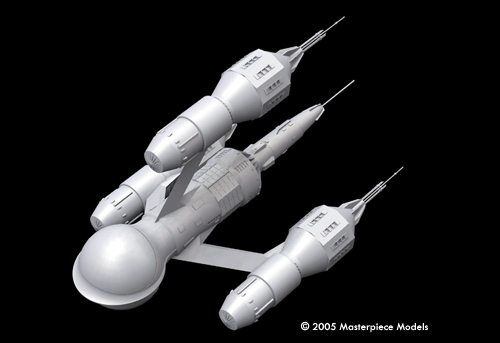 This model replicates the hero prop used on the Galaxy Quest television series. This Nebulizer is being released in a limited edition of 100 pieces. Each nebulizer is molded from a screen used original and cast in high quality polyurethane resin, painted to match the original, and includes interactive lighting and authentic digital sound effects captured from the film. Renegade Toys and Games have announced their first paper model, the non-scale Incredibles® Omniroid. This model is available for free download for a limited time by visiting the Fiddler's Green site. Now available for a limited time from Alex Creations is a 1/1450 scale model of Captain Harlock's Blue Arcadia. This limited production kit consists of 58 resin parts in all plus a photo-etched set and color decals. The finished model will be over 28 cm in length. VoodooFX have released a lighting kit for the newly-retooled Lunar Models Flying Sub kit. This 9 Volt battery- powered kit comes 99% plug in play install, and includes front searchlights, rear engine lights, fusion FX light, floor panel lights, and upper interior lights with on/off switch and full instructions. 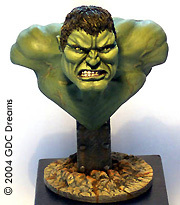 GDC Dreams announces this new highly detailed, 1/6 scale resin bust kit of the Green Giant, based on shots from movie version character. The kit consists of three pieces (all in quality resin), as well as instruction chart and certificate of authenticity. Original master sculpted by Guillermo Centeno. Wilco! 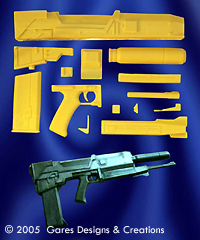 Models' newest kit release is the Atomic Disintegrator Pistol (from "Sky Captain and the World of Tomorrow"). It consists of two pressure-cast resin pieces and is eight inches long. 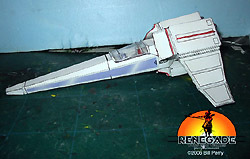 Samurai Monkey have released a 1/72 VF-1 Valkyrie Atmospheric Booster that complements the Hasegawa VF-1. Sculpted by John Moscoto, this 19 part, all-resin kit includes parts to modify the Valkyrie kit to match the brief opening sequence of the "Viva Milia" episode where this vehicle makes its only appearance. JBOT have released new ALPS-printed waterslide decals for Battlestar Galactica subjects. For the Colonial Viper, in 1/48, 1/32 (Monogram kit) and 1/16, is a full set of markings that contains three variations in engine striping patterns and two variations in topside wing patterns. 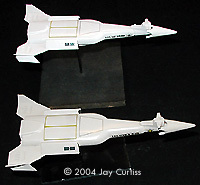 Also included are markings for the "Silver Star" squadron from the BATTLESTAR PEGASUS. The basic stripes are available in red, orange, yellow, white, green, blue, purple, brown, black, silver, gold, copper. Also now available is a separate sheet of generic "kill markings" for both Colonials and Cylons, in the same scales. "Little Big Man" is the latest release from Toi Ogunyoku Jr. This 1/6th scale resin kit is approximately 15" tall. It consists of 21 parts, all cast in a high quality grey resin. An instruction sheet and color photos are included. New at Specialty Press is the final volume in a trilogy covering the design and development of British fighters and bombers from the end of the biplane era to the present day. BRITISH SECRET PROJECTS 3: Fighters and Bombers 1935-1950 is a treasure trove for the speculative modeler. It emphasizes the designs which were never flown covering projects prepared from the mid-1930s onwards, influenced by the growing threat of another war with Germany, through to some projects which appeared after the war was over. As in the trilogy's first two volumes, these designs are covered with detailed descriptions and data and numerous photographs of models or artists' impressions showing how these designs would have looked. 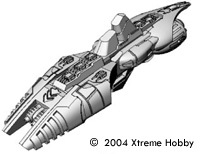 Xtreme-Hobby is proud to announce a new line of miniatures called Cold Navy. Cold Navy is a general purpose miniature line designed to provide super-high quality starship miniatures to space combat players and collectors all over. These miniatures will be cast in aquaclean, lead-free pewter. They are scaled at 1/12000 scale and ranges from sizes of 30mm all the way to a whopping 100+mm in length. 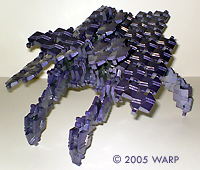 However, we have made every attempt to make these vessels compatible with any scale within any genre, from small cutters and scout vessels in 1/2500 scale Star Trek to massive, super dreadnaughts in Fleet Action Scale Babylon 5. The initial run of fifteen starships, five each of three different factions is well on its way to being produced. Future releases will include three new factions per year for the next two years. This will make a total of nine factions. New ships for each faction will also be included. A limited supply of studio blueprints showcasing some of your favorite Sci-Fi vehicles are now available. These are copies of the actual studio prints that were used for the creation of special effects miniatures and full scale mockups. Stock is left over from this year's Wonderfest exhibits. The sale of these prints help to offset the cost of putting together this year's exhibits and the exhibits for 2005. Each print is available in "black line" ink on white paper only. They are displayable /frameable and are a great addition to any prop/model collection. The Icarus - "Planet Of The Apes" - 1 sheet, 25 X 36 inches. Shows the full profile and top view. The Space Pod - "Lost In Space" - 1 sheet, 30 X 36 inches. All views and measurements. The Proteus - "Fantastic Voyage" - 1 sheet, 26 X 23 inches. Shows the full profile and top/bottom views. The Nautilus - "20,000 Leagues Under The Sea" 1 sheet, 36 X 45 inches. All views & cross sections. There is an adequate margin on each print, so they can be trimmed if desired. All prints are shipped in a sturdy mailing tube. Now available from Sci-Fi Models is a concept SciFi kit of a 2025 SA (Styer Arms) Police/Detective Special used by Detective Rick Deckard in the movie Blade Runner. This model kit was built by combining 2 different guns, the Steyr Mannlicher Model M (instead of the Model SL that was actually used for the original) and the Charter Arms .44 Special Police Bulldog, an original stunt casting for molding the cylinder covers and grips. The kit consists of resin and white metal parts, plus instructions and paint guide. 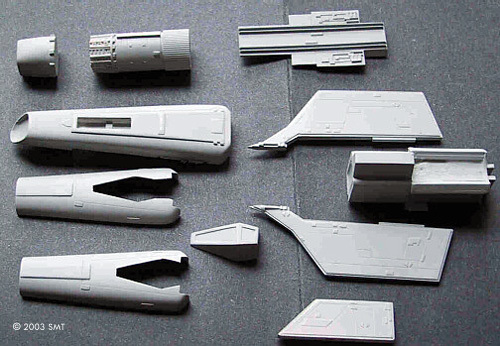 Sci-Fi Models also expects their upcoming 1/48 Cylon Raider kit, mastered by Alfred Wong, to be available by the end of this month. 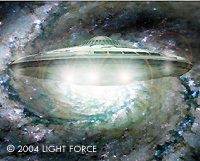 New from LightForce is the " Triangular UFO", allegedly a real USAF craft which has been sighted all over the world. The kit is comprised of 5 resin pieces and is hollow when assembled. It is about 1:144 scale (the points of the triangle fit inside tangent to a 6 inch diameter circle). The kit comes with instructions and waterslide decals. Pulse Rifle Set - Pulse Rifle, Grenades, Scope, Helmet, Earpiece/Mic, IR Sight, Neck Guard, Cutter/Welder, Motion Tracker, and Shoulder Lamp. Smart Gun Set - Mic, Camera/Headset/Sight, Ball Hat/goggles, Cutter/Welder, Shoulder Lamp, Smart Gun, Hip Pivot Mount, Gun Swing Arm, and Hip Swing Arm. Flame Thrower Set - Shoulder Lamp, Motion Tracker, Cutter/Welder, Flame Thrower, Helmet, Earpiece/Mic, IR Sight, and Neck Guard. Shotgun Set - Cutter/Welder, Motion Tracker, Shotgun, Helmet, Earpiece/Mic, IR Sight, and Neck Guard. Martian War Machine--- Solid cast-resin body, translucent green and amber parts included, 9-1/2" wingspan (1/72nd Scale). $30.00 USD (~$40.41 CAN/€ 24.62 EUR ) plus $5.00 shipping in the US. 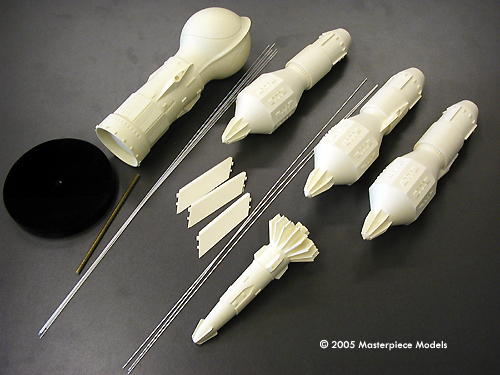 Cosmostrator (from "First Spaceship On Venus"): 1/350th Scale, 8-1/8" tall, four resin parts plus sculptural base. $30.00 (~$40.41 CAN/€ 24.62 EUR ) plus $5.00 shipping in the US. 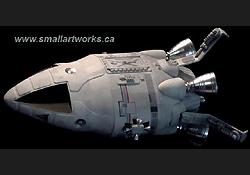 The U91035 Proteus (from "Fantastic Voyage"); 1/48th Scale (or, you could say "1/1 Scale as seen 27 minutes, 44 seconds into the film"), 11-1/2" in length. Full interior, color decals, includes 5 figures. $40.00 (~$ 53.87 CAN/€ 32.83 EUR ) plus $5.00 shipping in the US. TheModelBase.com is a new manufacturer producing resin bases for models and action figures. Their "Base-ics" series of bases come in two sizes, and may be optionally cast in clear resin. The designs are mainly Star Trek or Star Wars themed, but other generes such as Neon Evangelion, Gundam and popular movie and tv titles will be added as well. Their latest design is for the new PL release of the NX-01. This base will be quite large to accommodate this huge kit, and will offered as a limited edition of 75 pieces and only in off-white resin. They are currently taking orders for this item at an introductory price of $20 (through June 30th). After June 30th the price goes up to $25 each. In the works are a series called "Environmentals", multiple piece designs that simulate environments for figures, only they could be a little twisted and dark. These will come in standard figure scales of 1/35, 1/8 and 1/4. Also projected are a series of bases to fit Gundams in the 1/144 to 1/100 and 1/60 scales. 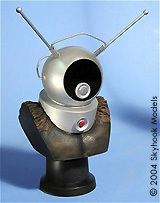 Skyhook Models is pleased to announce this remarkable bust of Ro-man, the diving helmeted gorilla from another world. This1/4 scale kit measures 7 ¼"/ 185mm from the bottom of the base to the top of the helmet. 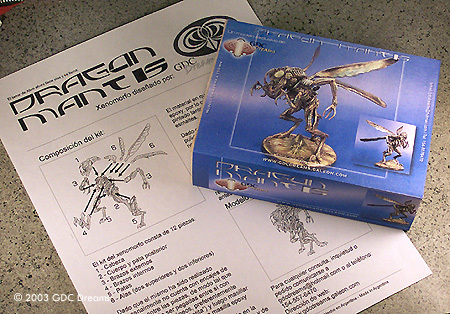 17 parts (resin, metal and acrylic) are included in this kit, as well as detailed instructions. Also, you can choose to have a black face plate as shown or leave it clear to reveal a shadowy face beneath. Sculpted by Dave Bengel. 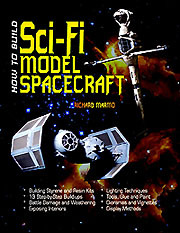 Just published by Specialty Press is Richard Marmo's guide to building s/f models. HOW TO BUILD SCI-FI MODEL SPACECRAFT takes readers through step-by-step buildups of styrene & resin science fiction kits and provides advice on basic kit assembly as well as combining kits and customizing kits with scratch-built pieces. The softbound book has 128 pages with over 325 color and black and white photographs and illustrations. The author is a professional model builder and prolific author. 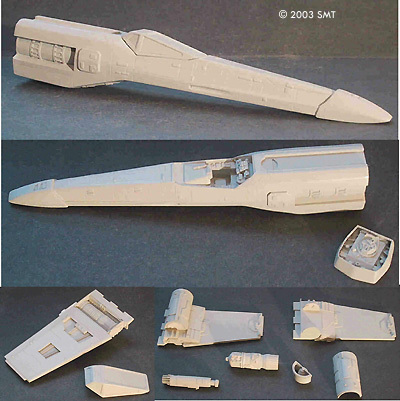 Sci-Fi Models is proud to announce the release of a 1/48 Colonial Viper Mk 4, based on the design from the failed DeSanto/Singer BSG revival project. Mastered by Alfred Wong, this kit is approximately 9"/ 229mm long when completed and consists of over 10 parts including interior and pilot. Paint and assembly guides are included. WILCO! Models announces its newest kit, the sleek and deadly Martian War Machine from the classic War of the Worlds. With a wingspan of 9½"/ 242mm, the 1/72nd scale kit consists of 10 pressure-cast resin parts (3 opaque, 6 translucent green, 1 translucent red). 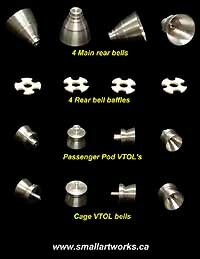 Small Art Works have released turned aluminum engine bell kits for the PE Eagle Transporter kit. These parts, which are made to order, include the main rear bells and baffles, passenger pod and cage VTOL bells. Bowing to popular demand, cozmo is making the Galactic Cruiser kits available to the general public. The models, which are either 1/1400 or 1/2500 scale your point of view, are early results from the 'Strategic Space Command' project on the Discussion Forums. Both come with decals ALPS-printed waterslide decals. The Mk I has 13 resin pieces and markings for ten ships in two styles. 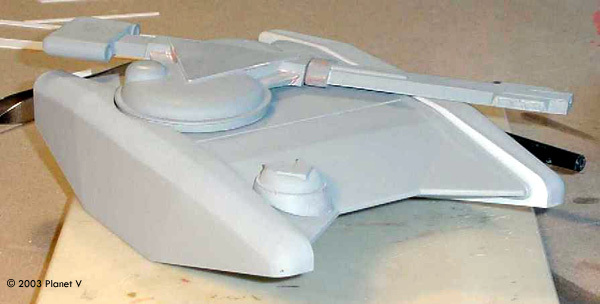 The Mk II has 49 resin parts and two pieces of styrene, with options for different wings and nose caps, plus two shuttles and markings for eight ships in two styles. 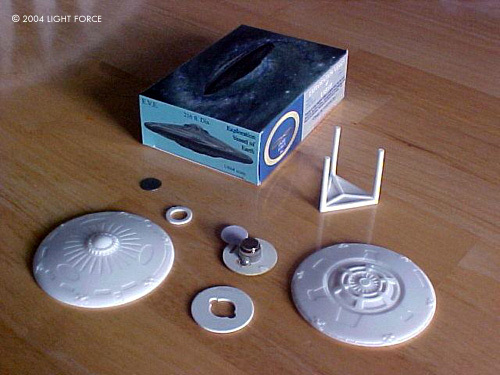 LIGHT FORCE have released a new injection-molded flying saucer kit. 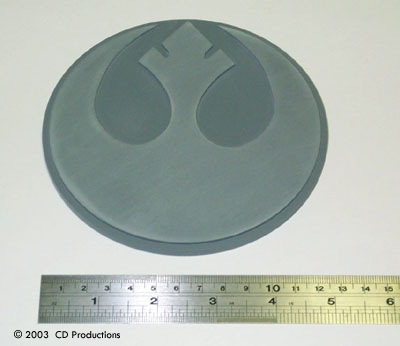 It is 3"/76 mm in diameter - just right for gaming and collecting. Features include rotary blinking lights, stand, Collector Box, magnetic assembly and instructions. Small Art Works is proud to announce the availability of a 44" Transporter Model Lab Pod. It's quick and easy to build, and made of cast urethane resin. Extremely accurate, with details identical to original studio model, it was mastered using measurements taken from original studio model. Turned alumiunum VTOL bells will be included in the kit. Turned aluminum attitude thrusters (the little quad clusters on the outriggers) available optionally. (The original studio model ones were actually painted plastic). Overall finished length of pod is 15-5/8". 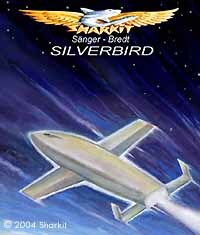 Sharkit's latest release is a 1/72 resin kit of the Sänger-Bredt Antipodal Bomber Silverbird, a WW2-era hypersonic spaceplane designed to be launched horizontally on a rail, then ascend to the edge of space where it could "skip" across the upper atmosphere to hit targets virtually anywhere in the world. Over 20 parts make up this model. The body, except for the nose canopy, is one single hollow resin part with nothing to sand or fill. Landing gear is provided so the model can be displayed in its landed configuration. A detailed cockpit and positionable hatch/canopy are also included. New for 2004! 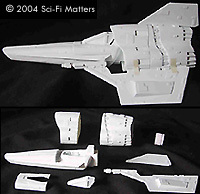 Battlestar Galactica Accurizing/Detail Set for the Revell/Monogram or MPC Galactica model kit. The kit is comprised of over 20 pieces, including new nose caps and end caps for the landing bays. It was remastered from the Sublevel 3 kit and used with their permission. Price is $25.00 USD (~$ 32.25 CAN/€ 19.77 EUR ), plus shipping. (Picture is of the original sublevel 3kit; new end cap and landing bay details are not shown here). 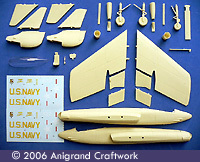 Also new for Jan 2004 - Transport Craft: This 1/144 scale resin model kit builds to a model 12" long x 7" wide (305mm x 178mm). Mastered by Alfred Wong and produced by SMT, the kit is comprised of over 25 resin parts. Paint, decals and instruction guides included. Price is $110.00 USD (~$ 141.90 CAN/€ 86.97 EUR ), plus shipping. 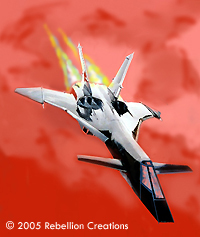 Coming very soon - Visitor Fighter: Finally a STUDIO SCALE resin model kit. It's as accurate as you will find since it was molded directly from the large ORIGINAL studio model. Model is hollow cast and measures approximately 15" long and 9" wide (381mm x 229mm). It includes optional landing gear and bays but no interior yet (this may be offered later). Depending on sales the shuttle and tanker variations may follow as add-ons! Includes certificate and photos of the original for detailing; Decals will be produced by JTGraphics. Photos depict the original studio model. 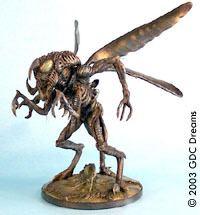 TimeSlip Creations first release is a 1/20 scale "Warrior Bug" from the movie Starship Troopers, sculpted by Dan Perez. The 28 resin pieces build into a monster measuring about 12" long, 8" wide and 9" tall (305mm x 203mm x 229mm). The kit's joints are all ball-and-socket to enable the builder to make a variety of poses. Phil McCracken Models is now in full scale production of a stunning model of Stargate's portal to the stars. 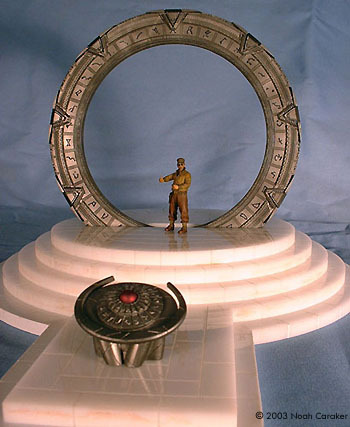 The 1/35 scale kit, comprised of 47 resin parts, includes parts to build either a TV or movie version Stargate, plus DHD, a large base and a detailed instruction sheet. 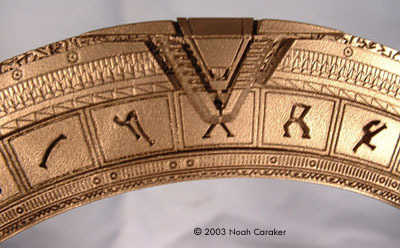 The master for the gate itself is not based on the base to MRC's Anubis/Ra kits, but rather an extremely detailed (front and back) stereolithographed piece. Price is $120.00 USD (~$154.75 CAN/ € 94.89 EUR ) + shipping. For more information please visit their website. 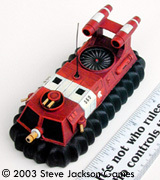 1:48 scale Patrol Craft. 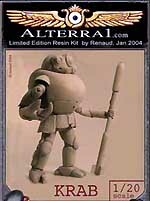 This all-resin model kit is about 8"/20.3 cm long when completed. Over 15 parts, plus paint/ instruction guide and decals by JTGraphics comprise this kit. Interior, pilot AND landing gear included. Kit contains both parts for the single seat and double seat '1980' variant. Price is $80.00 USD (~$ 104.89 CAN/ € 68.09 EUR ) + shipping. 1:48 scale Rapier. This all-resin model kit is an original design by Alfred Wong based on his designs for the Sierran Star Command mutli-role fighter. Pilot figure and decals included. The model is a pproximately 11" long and 7" wide (28cm x 17.8cm) when completed. 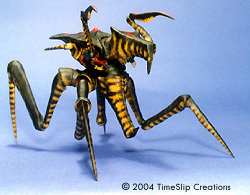 This is the first in a line that SMT hopes will bring more original designs into modeling. Price is $120.00 USD (~$ 157.35 CAN/ € 102.14 EUR) + shipping. Chris Trice and Daniel Prud'homme have produced the most incredibly accurate Eagle blueprints that are possible to be made. Designed specifically for model making and in development for 15 years, every single component of the original first "hero" 44" miniature, as it appeared throughout the bulk of Season One, is faithfully documented in exact detail. All parts are rendered in detailed orthographic views along with isometric views to help illustrate parts location and proportion. Measuring 24"x18" and plotter-printed on 14-lb paper, these eight sheets were designed in three dimensions and then output on a C.A.D. system. Even the "kitbashed" and "hidden" detailing that was used on the original model is very accurately reproduced. The drawings are printed in 1/48th scale, the same size as a 22" Eagle, exactly half the size of the actual 44" model. 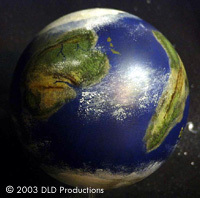 DLD are also now offering Custom Painted Planets. These are not styrofoam balls, but acrylic globes. You pick the type, (Temperate, Desert, Ice..), then the size, (100mm, 80mm, 60mm, 40mm), and then the "Base Color" and 2 other colors. This makes up your "Base Cost". You can stop there, or add more colors for an additional charge. Also new is Dunnhaven Castle, a 10mm castle that was designed for use with Warmaster by Games Workshop. The castle measures 22"/55.9 cm across the front and 15"/38.1 cm from front to back. There are 4 Large Towers, (60mm across), 4 Gate Towers, (40mm across), 25 Wall sections, (40mm across), 1 Gate Section, 1 set of doors, (1 open, 1 closed), 1 Wall Rubble section, 1 Large Tower Rubble section and 1 Gate Tower section. The castle is modular, meaning you can set it across a table, or back it up to a cliff/hill side, and you can add additional sections. (Separate Walls, Large Towers, and Gate Towers will be available soon.) Price is $75.00 USD ($101.28 CAN/ € 64.85 EUR ). Also, they are having their "Summer Offensive Sale" featuring 30% off a number of kits for a limited time. New from Planet V is a an authentic 1/72 scale reproduction of the deadly Game Tank seen in the movie TRON. 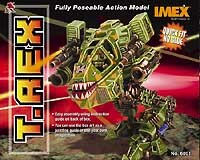 This model kit measures 8 inches long and 6 inches wide (20.3 x 15.2cm), and comes complete with three scale light cycles. The kit is comprised of ten resin pieces and comes boxed with painting guide, assembly instructions, and several full color shots of the finished kit. This is a limited run kit, so when the molds are dead no more will be made. For now, kit is only available through Planet V (eMail: SkardyKat@aol.com) at $55.00 USD (~$77.63 CAN/ € 48.70 EUR) per copy plus $8.75 for (domestic) shipping. Quantities are limited and orders will be filled on a first-come, first-served basis. After Wonderfest (June 7-8), production will ramp up and the kit should be available through Federation Models and Monsters-in-Motion. You can see a sneak peek of the unpainted prototype here. 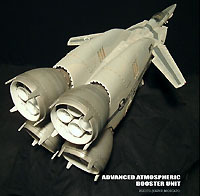 Controlled Energy Designs will soon be making their debut with a 1/72d scale Bonehead Fighter. 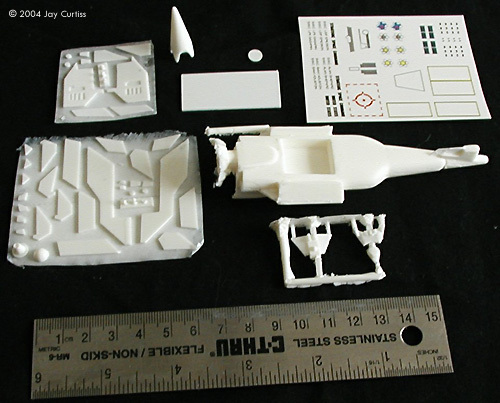 This kit contains 20 resin and one vacuform pieces, including bonehead pilot figure and detailed cockpit, plus detailed instructions and full-color box art. 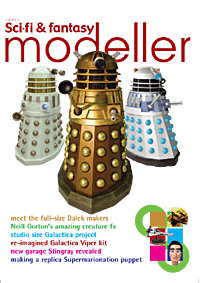 The kit will be available shortly from Federation Models, so keep your eyes on their website. You can see a sneak peek at the boxart here. 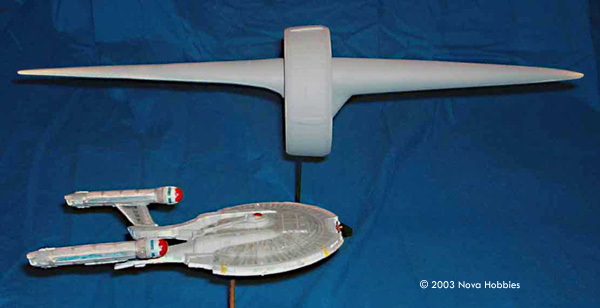 Nova Hobbies has sent a test-assembly shot of their upcoming 1/1400th-scale Surak-class Vulcan cruiser from Enterprise. 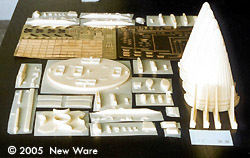 This 16"/40.6cm model was mastered from the actual plans of the ship in the series. The model in the photo lacks finishing details like panel lines and windows, but is otherwise complete. 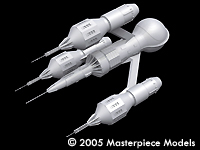 The Surak class ship is about 2.5 times the length of the NX-01 in 1/1400 scale. Nova expects to have this ship completed by mid-May, with production starting in the end of May or the beginning of June. They will keep the existing ringship model available as a non-canon scout craft until the existing mold life runs out. For more details on price and availability, stay tuned to Nova Hobbies' website. SMT has a number of new releases in the pipeline. New for June 2003 is a 1:72 scale Outrider model kit, created by Zarkus Models and produced by SMT. 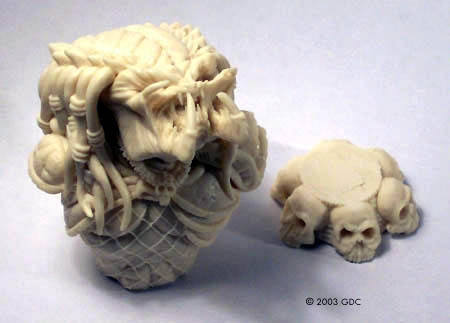 This kit, comprised of 20 resin pieces, will be hollow cast for easy lighting. It will be a limited edition of only 100 - due to the complex nature and size of the kit. Price will be $140.00 USD (~$197.62 CAN/ € 123.98 EUR) + shipping. Also coming soon is a 1:48 scale X-wing, based on the filming miniature and mastered by Alfred Wong. Price is to TBA. And finally, their 1:48 scale Falcon is progessing along nicely. There's still a while before it's ready - stay tuned to the SMT website for updates. Starcrafts have an ambitious summer line-up planned for release. Debuting at Wonderfest will be the NSEA Protector from Galaxy Quest. The finished model is 12 1/2" long (31.8 cm) and will be in 8 pieces. Included is the detatchable escape pod that crashes on the earth. Next up after that will be a 1/1400 scale Romulan ship from Enterprise. It is 6 1/2" (16.5 cm) long and is in 7 pieces. The engines will be clear green resin. No word on prices yet, but it's a good bet both kits will be available through Federation Models. After an absence of almost 20 years, Highlander Badgers have returned to Steve Jackson Games, kicking off the re-release of the Off The Wall Armies line of bizarre fantasy miniatures. Sculpted in 28mm scale, each army features anthropomorphic animal figures with weapons and gear from different historical periods. 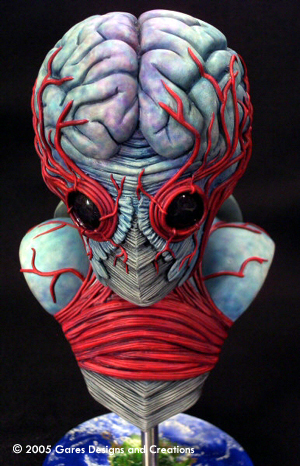 These figures are the delightfully strange creations of Richard Kerr, who sculpted all the figures and developed the bizarre universe they come from. The entire Off The Wall Armies line will eventually be available again, and Mr. Kerr is busy sculpting another generation of great new figures. Armies will be released approximately every other month. The Otterman Empire is due out next, followed by the Semi-Colonials, Something Fishy, the Snakes of Wrath, and Kat-anas. The Highlander Badgers are brought to you by Gray Cat Studios and Steve Jackson Games, and are available exclusively through Warehouse 23. Small Art Works has come up with more accessories to be used with the popular 22" and 23" Transporter models. Now available are a Cargo Winch Pod and Side Boosters. 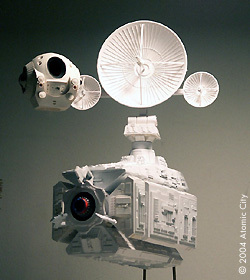 The winch and cargo pod model, cast entirely in urethane resin in about thirty seperate parts, simulates the look of the original studio models. It is made to fit the Replicas Unlimited 23" kit and can be easily adapted to fit the 22" models. The "winch mechanism" is removeable and can be replaced with the two "waste" canisters. The hoist assembly is also cast but the three support rods are made from bent wire. The side boosters are cast entirely in Urethane Resin. 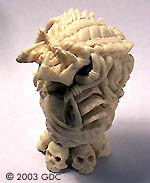 The individual units are each cast in only four parts, but special molding and casting techniques allowed the little piping sections to be cast directly attached to the model. The April 2006 issue of Fine Scale Modeler demonstrates using New Ware details and decals to construct a super-detailed 1/96 Saturn V based on the Revell kit. In order to provide more modelers the opportunity to use New Ware accessories in constructing an accurate replica of America's moon rocket, New Ware is providing a free set of 152 decals worth $8 with the purchase of the detail set. 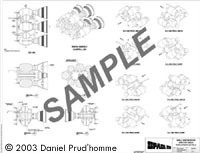 The detail set, awarded the "Model of the Year" by Starship Modeler when it was first released in 1999, comes with complete instructions and a CD of photos of the rocket and retails for $75.00 USD. The Saturn V walkabout CD contains 50 photos of the actual Saturn V's that are displayed at the Kennedy Space Center and Huntsville, Alabama. New Ware decals for the Saturn V consist of 152 decals for all the markings on the 4 foot tall moon rocket, and may be used to model every Saturn V, including Skylab. 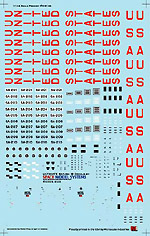 Included are replacements for the USA markings that Revell pre-printed on the plastic for the first and second stages. The decal set normally retails for $10.00 USD. Simultaneous with the Revell's re- release of the huge Saturn V, New Ware is providing a free set of the 152 decals when each detail set is purchased. The detail set, the decals, and the Saturn V walkabout CD are being offered at the special price of only $75.00 USD (~$ 85.16 CAN/€ 60.61 EUR ). This special value offer is valid for a limited time only until June 30, 2006. Space Model Systems has announced that their Saturn IB decals in 1/144 are now available, with newly-released placement docs. This sheet features totally new graphics for the Saturn IB, with markings for SA-201 to SA-210. There are enough decals for TWO Saturn IB boosters, providing one is an early flight like SA-201 and the other is a manned mission like Apollo 7, the Skylab ferries, or ASTP. It includes markings for Apollo 7's CSM, with the skewed UNITED STATESand "corrected" UNITED STATES service module marking for later flights, plus all camera targets and fin markings. $8.00USD (~$ 9.22 CAN/€ 6.71 EUR ) includes domestic United States and Canadian shipping. ($7.00 if no docs are required.) Professionally printed in the USA by Microscale. continues to pump out more high-quality X-plane and prototype models. Their latest releases includ the Vought KF7U Prototype (model pictured at right), Curtiss XF-87 Blackhawk bomber, the Douglas XA2D-1 fighter and the Convair XP-81 bomber. Unicraft Models has released two stunning new kits: The Coloni C-309 pusher-puller racer and the GermanMBB Lampyridae "Stealth" fighter prototype, both in 1:72 scale. Coming soon is the bizarre circular-winged Avro 606A & B jet projects, also in 1/72. 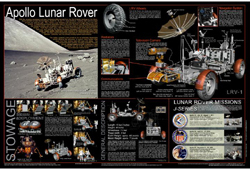 Available now from Bats in the Belfry is a high-quality, 18¾" high x 28" wide Apollo Lunar Rover poster that shows in accurate detail every aspect of the vehicle that assisted the Apollo astronauts in the exploration of their landing sites on the Moon. 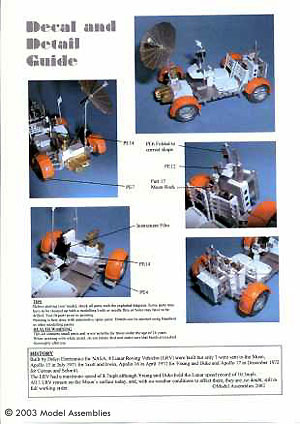 The poster illustrates how the rover was transported in the LM and then deployed onto the lunar surface. It also includes facts from each of their J-Series missions (Apollo 15, 16, and 17). This poster is a great addition to any student's or space fan's collection. (and just the thing for those who have EVA models' LRV kit). NewWare has just released a new kit for the Soviet/Russian real space afficianado. The Soyuz Dust Down diorama depicts the Soyuz descent capsule soon after its parachutes and retro rockets have been used to return the capsule safely to earth. The kit contains 21 resin parts, 38 photoetched parts and 81 decals. Since the descent capsule had many different markings for each mission, decals are provided so the kit can be built as four different Soyuz capsules. To mark Revell's release of the 1/96 Saturn V for the first time in over a decade, New Ware, Inc.© is offering a free set of more accurate decals with the purchase of its Saturn V detail set. 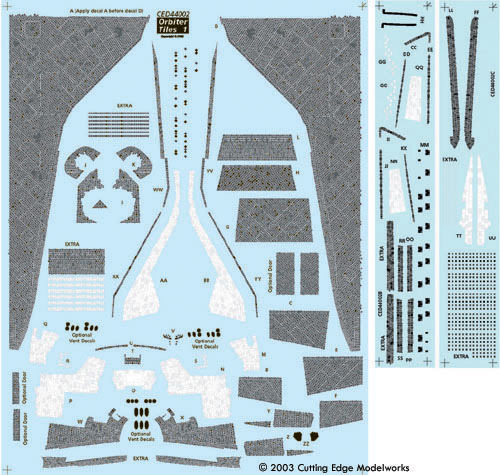 The set consists of 79 resin parts and 124 photoetched parts, including parts to convert the Command Service Module (CSM) from the Block I version of the Revell kit to the Block II version that actually flew on the Apollo manned missions. The detail set comes with complete instructions and a CD of photos of the rocket. The Saturn V walkabout CD contains 50 photos of the actual Saturn V's that are displayed at the Kennedy Space Center and Huntsville, Alabama. New Ware decals for the Saturn V consists of 152 decals for all the markings on the 4 foot tall moon rocket. The decals can be used to model every Saturn V, including Skylab. 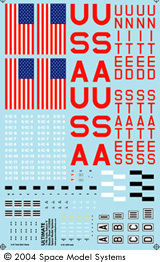 The decals have replacements for the USA markings that Revell pre-printed on the plastic for the first and second stages. Now available from Specialty Press is Scott Libb's SKYSTREAK, SKYROCKET, & STILETTO: DOUGLAS HIGH-SPEED PLANES. This hardbound book includes complete coverage of the little-known Douglas X-planes, including details of the first Mach 2 aircraft & the first-ever Mach 2 flight by Scott Crossfield. There are over 300 illustrations, including color photographs, in the 184 pages. 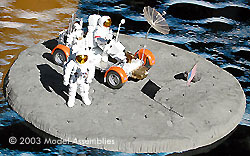 New Ware has released 1/32 scale astronauts for the Monogram Apollo capsule. 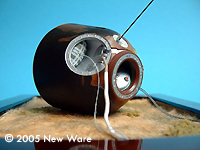 The New Ware figures, which depict the crew at the time of their launch, are designed to fit on the couches in the command module. The figures were sculpted by Ignacio Bernacer Alpera, who has sculpted several other figures for New Ware and is a prominent sculptor of figures. The set consists of three different poses with separate heads, with their "Snoopy" communication caps, vacuformed helmet bubbles, plus decals for the the mission patches and name tags for the crews of Apollo 8, 11 and 17. 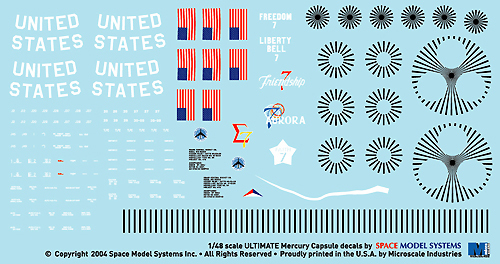 Space Model Systems, Inc. is proud to announce the arrival of the 1/12 and 1/48 scale decals for the Mercury capsule. 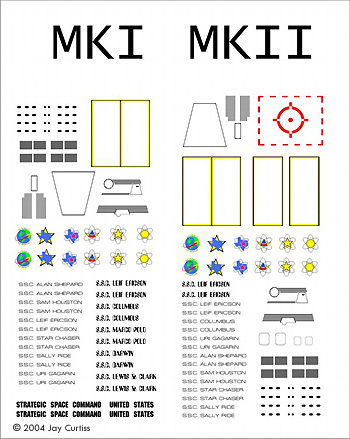 The 1/12 scale sheets are designed as replacements for the Atomic City/MRC kit decals (also designed by SMS) and include markings for all missions, plus new astronaut figure name strips and NASA "meatball" patches. Black-only sheet includes all retropack stripes (Friendship 7-on) and instrument dials. 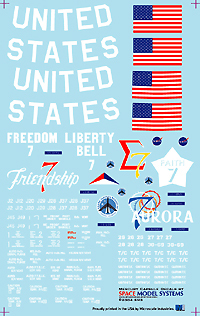 An Alps-printed Liberty Bell 7 "crack" is also included. The set sells for $11.00 USD (~$ 13.57 CAN/€ 8.31 EUR ) (without docs); price includes U.S. and Canadian shipping, all other countries please inquire about rates. The 1/48 set is intended for the Revell Mercury capsule kit and includes markings for all missions, plus the Liberty Bell 7 "crack." Sheet sells for $5.00 USD (~$ 6.17 CAN/€ 3.77 EUR )with informational booklet and placement map; $4.00 without docs. Now available from Accurate Models is a 1/6 scale "JOE" collector Mercury capsule Launch Escape System - accessory model kit. At over 37" (940mm) in length ( when joined to the "JOE" capsule ), this add-on replica helps to define as well as extend on the 1960's "JOE" collector series Mercury capsule. The mixed medium kit consists of injection pressure-cast resin, spun cast white metal, pre-cut brass tubing, and styrene plastic rods. Assembly steps are presented as 13 pages in Adobe Acrobat .pdf file format. After nearly a year in the making, Custom Replicas are pleased to announce their newest venture, Accurate Models, has its first model kit ready for general release: the 1/20 scale Apollo Saturn V - F1 Engine. The finished model measures 12.125" long ( on stand ) with a 8.125" diameter engine bell on an 8.75" by 6.75" rectangular display stand. The kit is mostly high quality injection pressure cast resin, with about 30% of the parts being white metal (high tin). Additional laser cut acrylic parts are supplied, as well as pre-cut ABS girders. The kit includes water slide decals covering 5 separate motor casing numbers, brass rod for rollable wheels (axles), 30 page viewable/printable set of assembly instructions on CD as Adobe Acrobat formatted .pdf type files (with both Mac and PC readers included) and well over 100 parts. The kit retails exclusively through Custom Replicas for $225.00 USD (~$ 267.19 CAN/€ 167.23 EUR ). plus shipping ($15.00 to most domestic US destinations). Overseas destinations need to contact Custom Replicas for a shipping estimate. For super detailing, there is a companion high resolution F1 engine photo CD for $29.95 USD (). All imagery is either 180 or 300 dpi .tiffs and .jpgs. Payment can be made via PayPal or money-order/cashier's check, until online-ordering can be set-up in the near future. General turnaround time is one week upon receipt of order. All orders will be confirmed by e-mail (where applicable). 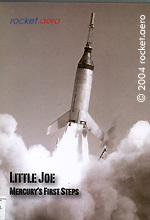 The premiere offering for rocket.aero is a DVD package entitled Little Joe: Mercury's First Steps, which focuses on a little-known chapter from the early days of America's space program. Built around a 22 minute core documentary, the DVD offers over two hours of in-depth coverage of the Little Joe program, including a special 'Modeler's Notes' track designed specifically for scale modelers. The DVD is encoded for all regions. Mark Lardas' new book , New Vanguard 99: Space Shuttle Launch System 1975-2004, distributed by MBI Publishing Company, is now available. This 48-page softbound book covers the design, development and operational history of the Space Shuttle, accompanied by many photographs and drawings. Hasegawa has reissued their 1/200 Space Shuttle kit, the one that includes the boosters. The shuttle features optional extended or retracted landing gear, and an openable payload bay with spacelab, connecting tunnel and manipulator arm. 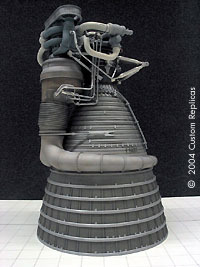 The main rocket engine nozzles also move as on the real shuttle. A base is included in the form of the caterpillar mover used to transport the real vehicles. 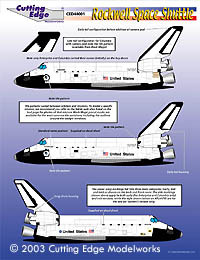 Decals are provided for the Discovery, Atlantis and Endeavour. 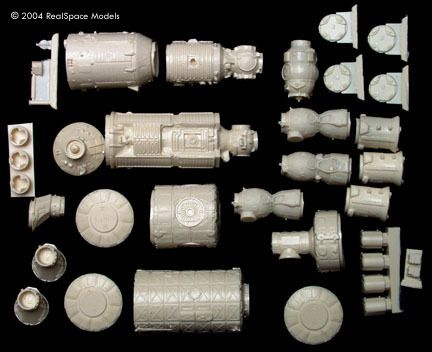 RealSpace Models has released a resin and photoetch detail set for the InterMountain Railway International Space Station. The detail set replaces all the pressurized modules currently on orbit. The new parts are more detailed that the parts that come with the IMR kit and includes replacement solar arrays for the Russian Modules. While designed for the IMR kit, they will fit the Revell space station kit with some "styrene engineering". 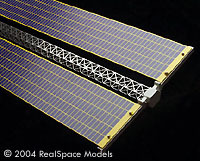 RealSpace Models has also released a nickel-silver photoetch replacement for the Solar Array support on the IMR kit. This replaces the square plastic tube that comes with the IMR kit. Nickel-Silver is stronger than brass and can be painted (unlike stainless steel). Once assembled into the solar array the support will not sag under the weight of gravity. 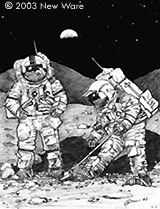 NW044 1/24 Last Men on the Moon (Apollo 17 - Cernan & Schmitt): kit contains 61 parts (21 resin, 40 decals) plus surface base. Space In Miniature has just published the sixth book in the Space In Miniature (S.I.M.) series, "Apollo CSM" . This volume, the first of a pair on the Apollo spacecraft, describes the configuration history of the Command and Service Module (CSM) that carried astronauts to the moon and back. The magazine-style publication has 61 pages of descriptive text, drawings, and photos designed to provide the modeler with all the information needed to build an accurate scale reproduction of any of the manned Apollo missions. 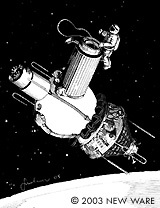 The historical section of this volume was written by David Weeks, who also created the numerous drawings that show all of the spacecraft's colors and markings and how they varied from the early Block I vehicles, through the Block II lunar-capable spacecraft, to the variations for Skylab and the Apollo-Soyuz Test Project. Chronological tables of all the Apollo missions, NASA drawings, and Weeks' text explain how the spacecraft evolved over those programs. 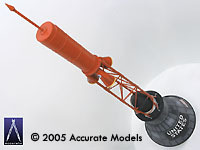 There is also a thorough section on modeling the Apollo CSM, including a detailed review by Karl Dodenhoff of the Monogram 1/32nd scale kit, a list of all kits ever produced of the CSM, plus over twenty kit reviews. Specialty Press have released two new books on the X-15. The first, Hypersonic by Dennis Jenkins & Tony Landis, was written with the cooperation of surviving X-15 pilots as well as many other program principals and is based on six years of research in Air Force, NASA, and North American archives. It covers the tasks of converting and testing the B-52 carrier airplanes, building the first full-pressure suits to protect the pilot, building the first engineering mission simulators, acquiring the remote lakebed landing sites, and building the radar range. It also covers the flight program is covered in detail, including an authoritative flight log; in many instances, information in this log was derived from the original flight data recordings. Also covered are each of the experiments that were flown aboard the X-15 late in its career when it became the workhorse of the space program, carrying such things as startrackers destined for the Apollo program and missile detection systems that would later be sent into orbit on satellites. 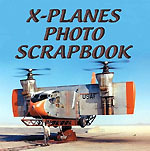 X-15 Photo Scrapbook, the companion volume to Hypersonic by the same authors, offers 400 photos in 108 pages. With over 350 b/w and 50 color photos, this scrapbook provides an excellent visual refernce for the X-15 research program. New Ware keeps cranking out kits. Their latest is NW032, a 1/48 scale Voskhod 2 Spacecraft. This kit is comprised of 159 parts (109 resin, 46 PE, 4 decals) and includes Alexei Leonov's figure to depict the first EVA. Price is $72 USD ($98.46 CAN/ € 61.25 EUR) shipping. 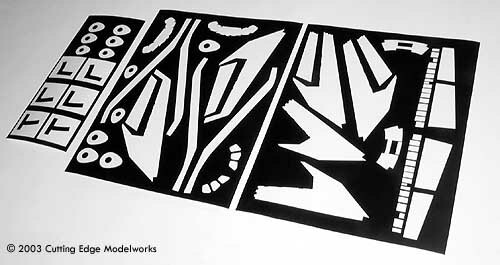 Also now available is NWD008, 1/144 scale R-7 Stencils decal sheet. The set consists of 124 decals for almost any possible R-7 model. 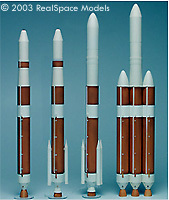 Decals are directly identified to use on models of ICBM - Sputnik - Vostok - Voskhod - Soyuz R-7 variants. Price is $5.00 USD + shipping. 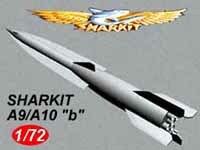 Cutting Edge Modelworks continues to add to their line of factual space kits and accessories. 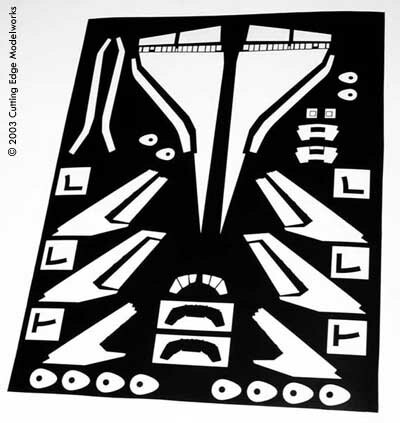 Now available, or coming very soon are Black Magic pre-cut vinyl masks, Cutting Edge decals and resin detail sets to upgrade any 1/72 or 1/144 Space Shuttle, plus a sheets of NASA and NACA logos in various sizes. 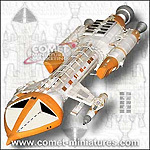 Now shipping are CED44001 and CED44002 Space Shuttle Markings for ALL Shuttles & Missions, in 1/144 and 1/72d scales. These sheets contain all necessary markings for any of the shuttles, and along with the BlackMagic precut painting masks sets (separately available), you can model any of the shuttle missions. The markings are based on extremely precise technical information provided by NASA. Price for each is $8.99 USD. CEBM44001 Black Magic precut vinyl masks for 1/144 Space Shuttle and CEBM72165 for 1/72 Shuttles are now available as well. Price is $9.99 USD (1/144) and $13.99 (1/72). CEC44003 - NB-52A NASA Mother Ship Conversion for Revell B-52H kit. CEC44004 - NB-52B NASA Mother Ship Conversion for Revell B-52H kit. CED44002 1/144 Space Shuttle Orbiter Tiles decals (sized specifically for the Academy kit, but should fit the others) are also available for pre-order. 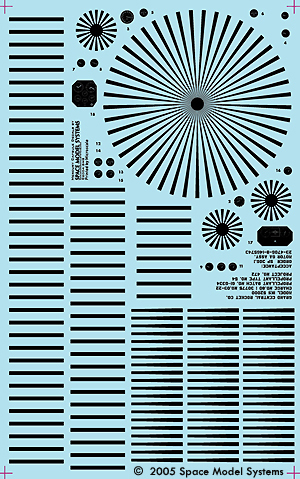 This HUGE set, based on precise engineering plans for the tile pattern provided by NASA, contains one full 8.5" x 11" decal sheet plus nearly one half of an additional 8.5" x 11" sheet. You can finally represent all the individual tiles actually seen on the Orbiter--in decal form. Price will be $18.99. CED72083 1/72 Space Shuttle Orbiter Tiles Decals for the 1/72 Revell kit are also available for pre-order. This HUGE set, based on precise engineering plans for the tile pattern provided by NASA, contains THREE full 8.5" x 11" decal sheets, enabling the modeler to finally represent all the individual tiles actually seen on the Orbiter--in decal form. They even include serial numbers for many of the tiles. Price will be $28.99. Also coming very soon are CED48236 NASA & NACA Logos in a variety of scales and sizes. 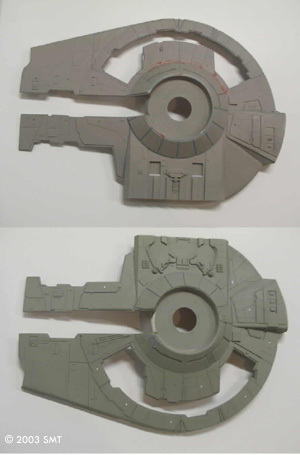 An in-depth review of Fine Molds' 900+ part Millennium Falcon kit. Studio-scale Y-wing project - ogle at the craft that was three years in the making. A review of Titan Find's Blake's 7 Liberator kit. Cyclops 'sculptorial' (a fascinating article that, in words and pictures shows, step by step, how to create a castable master fantasy figure). 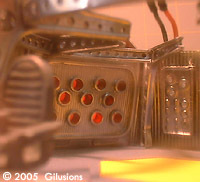 Explosive miniature effects from the Christmas Invasion Dr. Who episode. Mike Tucker on building miniature Alien Worlds and creatures. 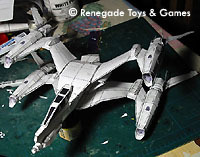 Classic Captain Scarlet Angel Aircraft scratchbuild. Massive Zero- X replica scratchbuild. Product Enterprise release update and reviews. Comet's new Martian Handling Machine kit review. Making futuristic props for a low-budget SF movie. Exclusive - and extensive! - Dr. Who series 2 feature (so hush-hush it's under wraps until one minute past midnight on the publication date!). Vehicles of the imagination - meet the amazing All Terrain Scout Craft, plus other fantasy hardware scratchbuilds guaranteed to get those creative juices flowing. Pulsar.GS have introduced a new way of making your own dry-transfer, rub-down decals, the Decal Pro system. This system enables you to print full-color images, including white and 12 metallic colors (including two holographic reflective types). These decals have no excess carrier film, leave no residue, and can be easily removed with rubbing alcohol without damaging the underlying surface. A laser printer or photocopier (or at least access to one) is required, however. New Stingray garage kit reviewed. Making a replica Gerry Anderson puppet. VoodFX have released several new lighting kits. 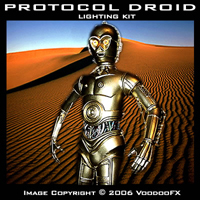 First up is the Protocol Droid Lighting Kit, which fits MPC Kit No.1913 and AMT no.1935 C3P0 models. It will work for any similiar scale vinyl kits too. This lighting set features eye lights and clear eye cup, and includes Pro 2 Driver Board, hook-up wire, shrink tubing, 9 Volt battery hook up, On/Off switch, full instructions and access to the Customer Support Line. Some electrical experience is required. Price is $24.95 USD (~$28.76 CAN/€ 20.93 EUR ), plus shipping. 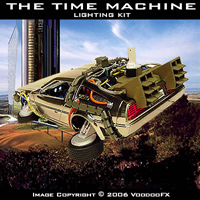 Next is the Time Machine Lighting kit, for Polar Lights #6811 Back To The Future Time Machine (DeLorean) model. This set features lighting for the headlights, taillights, dasboard instruments and other interior lighting. It includes Pro 6 Driver Board, 6 super-bright LEDS, hook-up wire, shrink tubing, 9 Volt battery hook up, On/Off switch, full instructions and access to the Customer Support Line. Price is $39.95 USD (~$46.05 CAN/€ 33.52 EUR ), plus shipping. Also new are the Proline Strobe & Fader Circuit Board Kits. 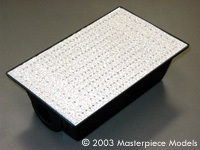 These prefabricated circuit boards are great for any lighting project. 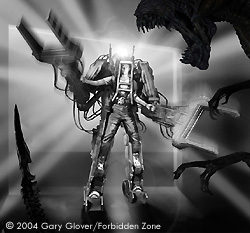 The Strobe kit may beused for navigation or strobe lights, interior cockpit/computer wall effect, alarm and danger lighting, 3D projector effect, hand props, weapons, scanners science collecting devices. The fader kit is good for engine power up and down cycle, reactor core effect, wall interior/exterior effect, slow or fast pulse, laser canon build up, hand props, weapons, scanners science collecting devices. Price is $29.95 USD (~$34.52 CAN/€ 25.14 EUR ), plus shipping. Price is $39.95 USD (~$46.05 CAN/€ 33.52 EUR ), plus shipping. 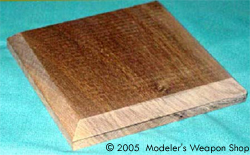 The Modeler's Weapons Shop now offers a line of unfinished quality hardwood bases for your display needs. 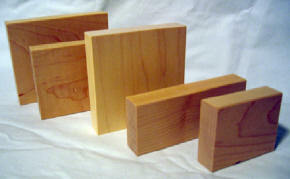 These are a vailable in select sizes and shapes with either square, cranked or beveled edges. (6" x 8" cranked edge, unfinished walnut base for $6.49 USD shown at left). These bases are offered in Walnut only at this time. Not new, but new to us, is Circle Scribe's cutting and drawing system. The system cuts perfect geometrical shapes with machined accuracy from cardstock, plastics of all kinds, wood veneer, metal foils, rubbers, etc. - all up to 2 mm thick. Other shapes that can be done include hearts, stars, polygons, ovals, arches, rounded corners etc.- in fact, methods for cutting almost any simple shape can be designed. Circles as small as 5mm in radius and as large as 100mm radius (with the basic system; with the new extension piece the maximum size is 16 inches diameter). Sizes go up in mm of radius so you can cut any whole number of mm radius between 5 and 100. Various extras are available, including instruction booklets for more advanced shapes and textures, blade holders and the aforementioned extension. 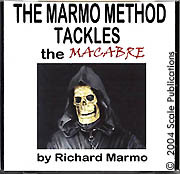 Scale Publications has announced the next in their series of How-To CDs: The Marmo Method Tackles the Macabre. The CD, by the author of How To Build SciFi Spacecraft, contains over 200 images and contains chapters on: BATES MANSION, MUNSTERS LIVING ROOM, MUNSTERS KOACH, GRIM REAPER, UNHOLY DEMON, and THE MUMMY. All photos are fully captioned. The CD is produced in HTML format; Internet browser required but a connection to the internet is not. 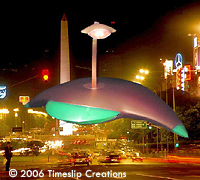 This page made possible by Starship Modeler - © 1997-2006. Last updated on 13 September 2006.